At Brooks, we take running and running technology pretty seriously. Our specialized high-tech features are what really set our running shoes apart. Running is all we think about. All of our running shoes are designed and built with smart technologies to give you the right fit and function on every run. Brooks DNA is made up of a non-Newtonian material or more simply put, a material that adapts to the specific force you apply to it. Part of the brilliance is that this compound was engineered to perform at the molecular level (picture millions of resilient 'nanosprings'). If you looked at Brooks DNA through a microscope, you'd see that it's made up of individual molecules connected in strands. These strands (which form chains) react to the amount of force placed on the foot, dispersing pressure and providing resiliency. 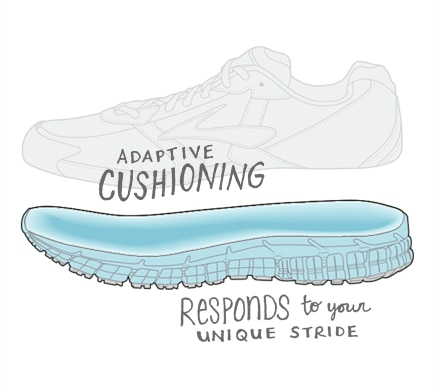 Bottom line of this physics lesson: You get tailored cushioning that reacts to your specific weight, pace, gait, movement and running environment – "made-for-me" cushioning vs. "one size fits all." A good way to think about how Guide Rails work is to picture a bobsled track. As the bobsled rockets down the icy course, the crew works to guide it down the "line" – the ideal path through the course. The fastest times are achieved when the sled glides effortlessly down the course with limited side-to-side movement. Much like the bobsled, runners perform best when they stay within their personal "line" – what we like to call their Natural Habitual Joint Motion. Guide Rails are designed to do just this – help runners maintain the most efficient and natural motion throughout the run. When we take a step back to examine how runners run, we recognize that the highest amount of impact happens as you propel yourself forward. 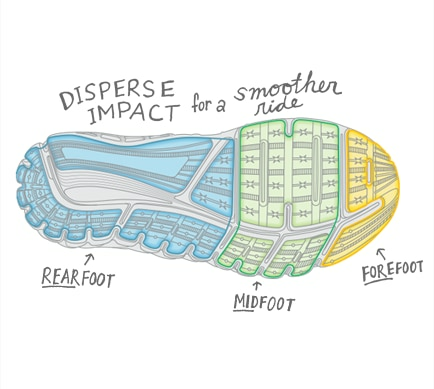 Knowing that this is the moment of highest impact, we’ve reshaped the outsole to disperse pressure evenly throughout your whole foot -- from heel to mid-foot to forefoot. We combined our experience in retroreflective, fluorescence and contrast with new research findings on eye function, cognitive science and direction perception, shifting the conversation from one about "visibility" to one about "recognition". The Segmented Crash Pad customizes your foot's lay-down to provide amazing cushion and smooth heel-to-toe transition throughout the run. Super DNA is made up of a highly viscous non-Newtonian material or more simply put, a material that adapts to the specific force you apply to it. Part of the brilliance is that this compound was engineered to perform at the molecular level (picture millions of resilient 'nanosprings'). If you looked at Super DNA through a microscope, you’d see that it's made up of individual molecules connected in strands. These strands (which form chains) react to the amount of force placed on the foot, dispersing pressure and providing resiliency. Bottom line of this physics lesson: You get tailored cushioning that reacts to your specific weight, pace, gait, movement and running environment – "made-for-me" cushioning vs. "one size fits all." All of our running apparel is designed by runners for runners using innovative, high-tech materials. Our family of DriLayer® fabrics lets you go all out with comfort and confidence. Get noticed in low-light conditions with a flash of engineering brilliance. The look is striking, plus you'll be uniquely identifiable as a human on the run. This wool blend isn't shy about giving us the best of everything naturally-temperature control, odor resistance, soft comfort, and unabashed good looks.